Generally, it takes only a relatively small amount of power to switch ON/OFF a relay but the relay may be able to control a high power device, which makes relay an important device. 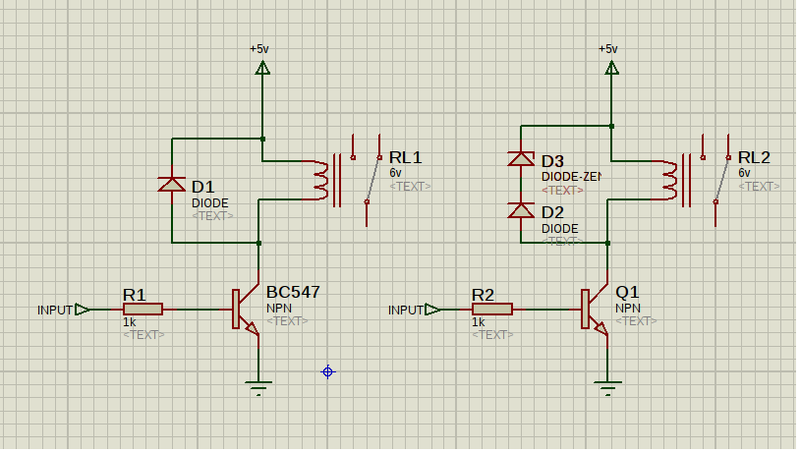 Electrical devices which contains a microcontroller or some other kind of logic circuit are more likely to have a relay inorder to interface the control circuit to the electrical appliance. For example, we can find a relay inside a washing machine, air conditioner, etc. In essence, a relay will insulate the control circuit from the controlled circuit. Now let us look at some specifications. Most of the details given above are self explanatory. Still there are a few things I would like to comment about. Note that the specification for a relay is divided into two sections coil data and contact data. The coil data is the electrical specifications for the electromagnetic coil part whereas the contact data is the specifications for the switching part(to keep it simple) of a relay. 4.5 V Pick Up Voltage means that the relay would sense a voltage as low as 4.5 V as a logic ‘HIGH’, even though the nominal voltage is 6 V. One of the most important thing to take care of when selecting a relay is the maximum switching current. We always have to make sure that the switching current of our circuit is well below the maximum switching current rating of the relay so as the relay wont get damaged . Now lets look at the working of a relay. A relay is controlled by applying a logic HIGH/LOW between the v1 and v2 terminals of the relay. When we apply a HIGH between the input terminals, current will flow through the coil which will magnetize it. The magnetized coil pulls the switch closed. Till now we were discussing about the input terminal. So what about the switch stuff?? Relays are designed to have either of the two switch positions namely, Normally Open (NO) and Normally Closed (NC). When no voltage is applied at the input of the relay, the Common Terminal will be connected to the NC pin. ie., when the relay is demagnetized, the switch will be in the Normally Open position whereas when the relay is magnetized, the switch will be in the Normally closed position as the magnetized coil attracts the switch from position A to B (see the figure above). 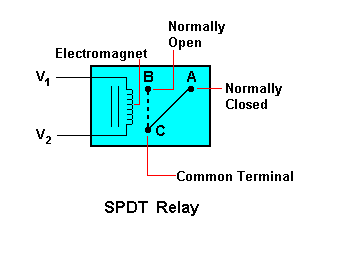 The switch has a spring which causes the switch to switch back from B to A once relay is demagnetized. 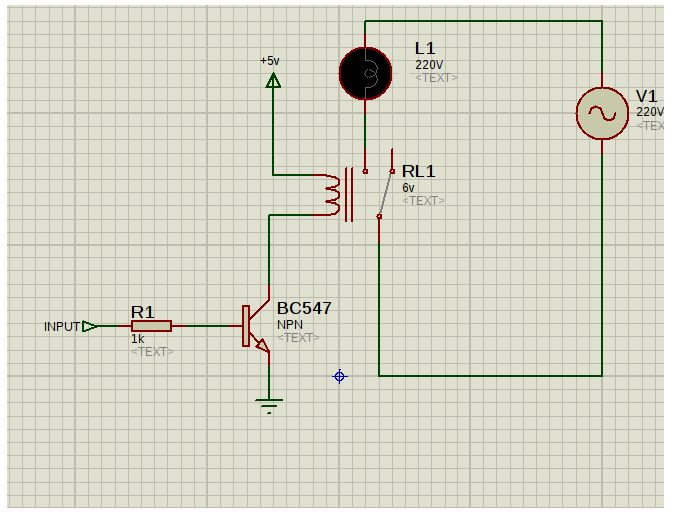 Now lets see how we can wire up a circuit using a relay. Since a microcontroller or any other logic ICs may not be able to supply enough current required to magnetize the relay coil fast enough, we always use a transistor as a switch to interface our control circuit to the relay. When we apply a HIGH at the input of the circuit, the transistor turns ON. This provides a low resistance path to the ground. Which means that now our relay is connected to 5 v at one of its input terminal whereas the other terminal is grounded. Studying this information So i am satisfied to express that I have a very good uncanny feeling I found out exactly what I needed. to remember this web site and give it a glance on a continuing basis. Always a major fan of linking to bloggers that I adore but really don’t get a lot of link love from.